The B-353LD is a very progressive laboratory microscope which we offer in two versions: one as a B-353LD1 and as a B-353LD2. 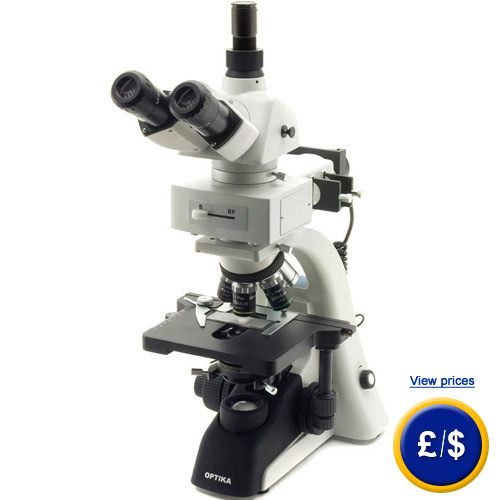 This laboratory microscope impresses with its stability, thereby it can be used without risk by anyone and requires no special protective measures. You need have no fear of damage, because you can use the laboratory microscope anywhere easily. Also you are not dependent on a power outlet near your workplace, because the laboratory microscope can be powered by a battery while using. The most important innovation at the laboratory microscope is the cold-light source. At the laboratory microscope B-353LD high-performance LEDs were installed instead of the traditional mercury vapour lamps. LEDs are very durable, so only one lamp replacement every 50,000 working hours is required. Moreover this light source is suitable for specific applications (FITC-TRITC). The bright field light of the laboratory microscope uses the X-LED™ system, it warms up barely while using and the color temperature is close to that of natural sunlight. Thus under the laboratory microscope an investigation, comparable to the in daylight, is possible. If there are any questions about this laboratory microscope, please have a look at the technical specification below or call: UK customers +44(0) 23 809 870 30 / US customers +1-410-387-7703.. Our engineers and technicians will gladly advise you regarding microscopes or any other products in terms of measuring instruments, regulation and control, or scales and balances of PCE Instruments. Centerable Abbe condenser with double lens. N.A. 1.25. Fitted with iris diaphragm, blue filter and filter holder. Height adjustment by a rack and pinion mechanism.